The Lancia Thesis was Odd, and I Like It. It’s no secret I’ve truly gone off the deep end with a love for anything that’s Italian with four wheels, and a love for cars that are quirky and odd. But, what, per se, would happen if you combine the two concepts? What would happen if an Italian automaker makes a luxury car that isn’t exactly better than its competitors, but still maintains a certain speciality? I’ll tell you what would happen: the Lancia Thesis would happen. 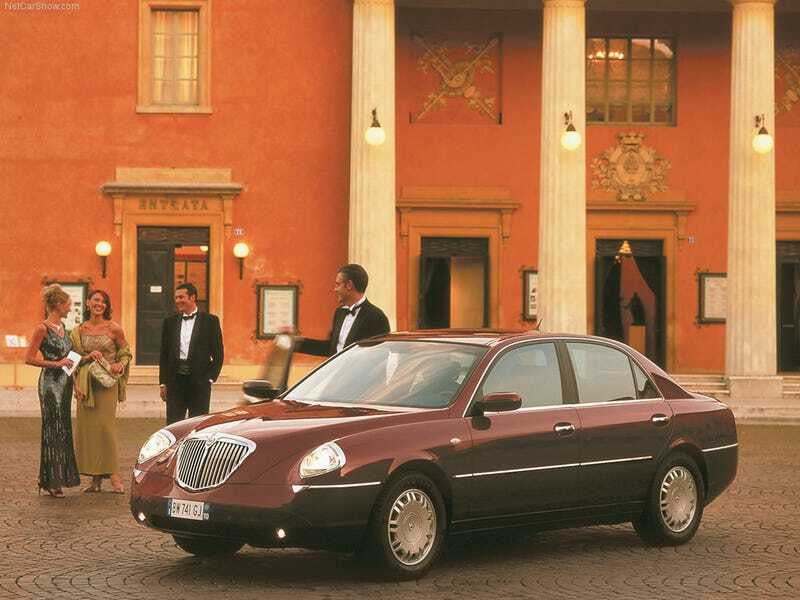 Born of the 1998 Lancia Diàlogos concept, the Thesis was Lancia’s entry into the executive car market of the early 2000s, the market that was mostly overrun by E39s and W210s. Designed to replace the modest Lancia Kappa in 2001, Lancia’s thoughts for how to attack the market was to do it with style, hence the odd styling choices for the car. Lancia’s chief designer said, “People will be looking for excuses not to buy this car. So, we wanted to be damn sure we didn’t give them anything to hook onto.” It’s definitely a bold claim, and it’s quite a jarring design upon first glance, but there’s a certain elegance here within the vintage dual pod curves of the front, the chrome grille, and the Cadillac-style vertical tail lamps out back. Lancia’s thought process into cornering the market didn’t stop at style, as the brand also took great attempt into making the car as technologically advanced as possible, offering certain amenities that some of its competitors did not have at the time of its inception. Bi-xenon headlamps were standard, along with the LED tail lamps in back. Lancia designed the Thesis on its own platform, which included a “multi-armaluminium-intensive suspension” with Mannesmann Sachs “Skyhook” adaptive dampers, a feature only seen on the Maserati Spyder. Lancia also upped the ante safety wise, with the Thesis being the first Lancia offered with radar-guided adaptive cruise control. All of the components listed above gave way to a smooth, comfortable, and quiet ride, one befitting of a true luxury car. Journalists were quickly impressed by its responsive handling despite the weight and front-wheel drive layout. Performance numbers were fairly impressive as well, with the Thesis receiving a slew of inline 5 and V6 motors, mated through a choice of a manual or automatic transmission, so it gets massive Oppo points for that. The interior was famous for receiving high marks as well, with standard rich Italian leather and exclusive fit and finish throughout. Lancia tried its hardest to strive away from using plastic finishes where unnecessary, and for the most part they seemingly succeeded. Every early 2000s amenity was, of course, available, so you have your shoddy sat nav and other features at your disposal. But, for the most part, I’d say that’s a nice place to be. So, yeah, the Thesis seems like an interesting, stylish attempt at what was at the time a rather bland market of the same brands. But, then it comes down to the real important part. Did this car work? No, of course it didn’t...otherwise, I wouldn’t need to write this article. Basically, Lancia overestimated themselves a little bit with the Thesis. Turns out people in the executive market aren’t exactly looking for brands out of the ordinary to choose from outside of your standard BMW, Audi, or Mercedes. The Thesis was sold from 2001 through 2009, and in that eight year period, only 16,000 units were built. Ouch. So, why do I like this thing so much? Well I just can’t help but have a heart for the cars that couldn’t quite make it in the world, cars that people seem to have forgotten or didn’t even know existed. To me, this car can best be described as the Italian equivalent of a Rover 75 or a Cadillac DTS. It’s an old form of luxury with some new luxury peppered throughout. A bold attempt by a fumbling automaker to gain some relevance in the world, and I believe it deserves a pass for that.